Birds Of Bellwoods have been well known for their lyrical storytelling, lush harmonies, and tight musicianship, that it has taken them far and wide within the alternative folk music scene. Thus, they have released a new single off their new album "Victoria". The single being "A Year Ago", that has been making the buzz news worthy for all to hear. That said, "A Year Ago", is just the glimpse into what can be expected from 'Victoria". The album kicks things off with the opener "Melatonin", a slow paced track with an upbeat and rather catchy tone going for it. You will surely find your feet tapping to the beats for sure. Next up is the buzzed about single "A Year Ago", which has already given you an idea as to what Birds Of Bellwoods sounds like, but hearing it play out in the album alongside the other tracks is quite pleasing. While you have heard it before, if not countless times already, it is still entertaining just as it was released on its lonesome. Next up are a few tracks that play off one another, "Don't Look Back", "Hey Hey", and Catching Up", all of which just play accordingly to one another. They each maintain their own class of flow to their musical melodies and vocal chords, each of which sound in check with one another. In short, each of these songs, just sound well played, they got upbeat tones, with catchy harmonies and melodies, that work well together. The rest of the album just plays off the same way. A number of those tracks "Something Good", "My Heart Is Yours", "Kiss Me". and "Let You Go", just doing a repeating method as the others, playing off one another, but still catchy and upbeat, being very dynamic in style and sound. Lastly has to be "Leaving Song", a track that just connects the entire album as a whole. It wraps up the release to being one that is unexpected but expected from an act such as Birds Of Bellwoods. 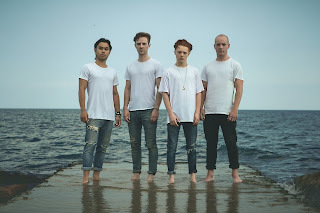 All in all really, Birds Of Bellwoods is one of those acts, you can like or dislike it has a middle ground that still makes the music listenable, and rather enjoyable, to whoever listens in to it. Simply how it worked out for both of them, both music and band alike.